The bigger you are, the more difficult moving is. It’s fun being a bigger company because that means you’ve succeeded, but it brings with it some additional challenges. If you have to move because you’re growing, that’s a good thing. Here’s how to efficiently move company’s data center: 1. Work with an Experienced IT Moving Company Some movers have experience with IT moves, while others do not. Find an experienced IT moving company and check their BBB rating and any other online reviews. Talk with them to see how they move data centers. Once you’ve built a relationship with a company you trust, use their moving service. 2. 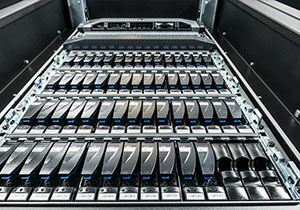 Purchase New Equipment, If It Makes Sense From a purely financial perspective, sometimes it makes more sense to purchase new data center equipment than it does to move it. 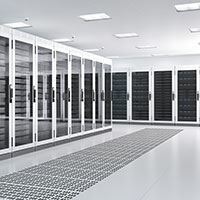 Audit the age and efficiency of your data center and all of its equipment before moving, and replace some of the older, inefficient equipment if you believe it makes financial sense. 3. Constantly Check to Make Sure You’re Sticking to the Plan You did create a plan for moving your data center, didn’t you? Good, but also do regular checks to make sure you’re still following the plan. During the chaos that sometimes ensues during the office moving process, it’s easy to get away from the original moving plan. 4. Prepare for the Worst, Hope for the Best Theoretically, a natural disaster could strike during your office move process, and all the equipment could get destroyed. What would your business do then? It’s not too likely that will happen. But if it, or something similar to it does, then you’re fully prepared for it. 5. Use Efficient Packing & Transportation Processes You may need to develop these if performing your move on your own. But, all of the CRN network members have these processes down perfectly. Believe it or not, it does take many years to get the data center moving system down to a science. 6. Assign a Single Internal Project Coordinator The more people and equipment involved in moving your data center, the more complex the move process gets. Assign a single employee to coordinate your move in conjunction with your CRN team. This gives you the best chance of having a simple, low-stress data center move. If you follow those tips, you’ll be in good shape as you move your data center. Still have questions? Contact a CRN member today. Moving a library isn’t as simple as it sounds in many cases. 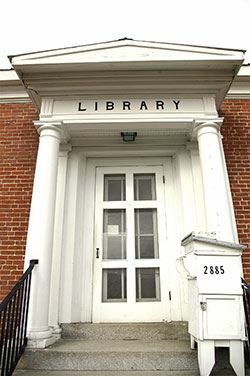 Libraries can involve thousands of books, documents, digital media, computer equipment and even offices. If you’re thinking about moving your company’s library, there are some important things to keep in mind before you move. Are your tangible items organized on fixed shelving units or stored away in filing cabinets? If on shelves, moving your books and files will require special book carts or portable moving crates to transport them off the shelves from origin to destination. Be sure to convey any instructions to your office and library movers regarding special organization needs when it comes time for packing your items. Request to have extra moving labels for book carts and crates so that they can be used to inform your movers concerning loading and unloading orders if needed. If you store your books and documents in filing cabinets than they can easily be transported without having to be removed from the cabinets. Your office movers will use special dollies to roll your cabinets from one location to the other without removing a single item from a drawer. However, you should keep your file keys with you to ensure they will be readily available at destination. Often keys end up misplaced or even damaged during a move if left in the cabinet. When it comes to moving other library assets like computers, printers and other electronic devices, ensure you have them disconnected by a professional and ready to move. Your movers will wrap your electronic assets in industrial grade anti-static bubble wrap and then place in appropriate moving containers with padded protection for safe relocation. It’s important to have each item properly labeled as well in order to have them delivered and set up in the appropriate destination space. One way to ensure all of your concerns and orders are properly understood and conveyed is to inform your office-moving foreman. He or she will then direct the movers as needed. Working with members of CRN is a smart choice when it comes to choosing who you want to handle your company’s library move. It requires professional experience, capability, and a ‘ready to serve’ attitude for a successful move; members of CRN have an abundance of each requirement so. Get the great moving experience you deserve with CRN office and library movers. Have you organized your cabling? Some businesses do this right away with their IT equipment. Others have never done it. Whether you have or have not, check out these tips to get and keep your cabling organized: 1. Label Every Plug How much fun is it to trace every cable back to its original destination? Is that really the best use of your time? It is if you are about to label your cabling. So, label it so you know where everything goes, and so you never have to do it again. 2. Use Cord Wraps If you have cables not in use, wrap them up on a cord wrap. They’ve been around forever and come in many different colors, so you can organize your cords by type when storing them. 3. Cable Ties If you need something a little heavier duty, get cable ties to keep cables from twisting and tangling together. Best of all, they’re cheap to buy. Why Should You Organize Your Cables? If you’re not a naturally organized person, you might wonder why this is even necessary. Do the benefits of organization really outweigh the time and money you invest? They do, and here are some of those benefits: 1. Improved Safety What if someone trips and is injured? Guess who’s going to be liable! It could result in an expensive lawsuit, or at least a worker’s compensation claim. Your equipment could get damaged too. You can avoid the stress and expense included with that for just a small cost of time and money when you organize your cables. 2. 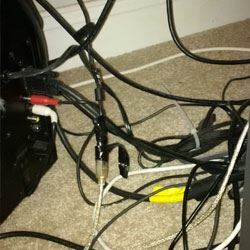 Reduce Frustration & Costs If your own IT team, or if you outsource your cable maintenance to a vendor, has to spend time figuring out which cord goes where, that’s more money wasted. Why not just organize everything in the first place and make everyone’s life easier? 3. Extend Cable Life and Save Money Cords that pile up and twist and tangle together are more likely to get damaged. This may not seem like a significant expense. But, from a business perspective, you can understand why it’s helpful to save every reasonable expense you can. 4. Look Better to Visiting Clients & Communicate to Your Employees that You Care Say your clients look under your desks and see a tangled mess. It’s not the end of the world, but it gives them an idea of how you might run the rest of your company. Your employees might get the same impression. When you run your business, don’t you usually like employees who pay attention to detail? Pay attention to this detail and employees and customers will respect you more. If you follow those techniques, your cables will be better organized. Your business will also be able to serve customers better, and you’ll save some capital too. There’s really no downside to organizing your cables. You can always move your server yourself, or have your local CRN member do it. In either case, it’s something that requires great caution. Here are some tips on what you should do to physically move your server: 1. Backup Your Data Before Your Move You should have automatically scheduled backups running already. Check to make sure they are running successfully. And if you haven’t done it yet, test out a data backup and restore. 2. Have a Disaster Plan in Place In most cases, nothing overly eventful will happen when you move your server. But, there is always the element of the unknown. Your physical drives could decide to stop working for unanticipated reasons. A car accident could happen that damages your backups. Your disaster recovery plan should cover what happens in the event of the most catastrophically damaging event your business could experience. 3. Label Everything Good preparation irons out a ton of wrinkles later on. Take pictures of everything. Make sure you know which drives came from where. Know which cable gets plugged in which connector. It’ll make your life so much easier once you are actually moved over to your new location. 4. Audit Your Software Requirements During a move is a good time to see what server software you currently need, and also compare it to your new needs at your new location. If you don’t need the service or software, get rid of it. You might also need some upgrades or new software. Whatever you need to do, you can do it now and be prepared for business at your new location. 5. Make Bubble Wrap Your Best Friend Wrap all of your servers in bubble wrap and place them inside of a box. You really can’t be too generous with the bubble wrap. 6. Hire a Professional Moving IT Company to do the Work for YouMany businesses attempt to move their servers on their own. But you don’t have to do this. There are many professional moving companies out there that specialize in IT moves. Don’t feel pressured to take on all the work yourself. Professional movers have insurance too, just in case the worst happens. Those tips will help you prepare your server for moving to your new location. And remember, your CRN team can always help you do the move if you don’t want to do it yourself. Sometimes, no matter how well your projects are managed, something comes up and derails their progress. Then, you’re left trying to find different ways to make up for the time lost. You should never cut corners. But, there are better ways to do things than others, so follow these steps to increase the efficiency with which you set up your data center: 1. Make Sure Everyone’s on the Same Page Prior to Setup IT, your CRN team, and your departmental leaders all need to be communicating about the various aspects of your move before it happens. Otherwise, when you begin the setup, you’ll have a number of people trying to communicate at once, which creates many logistical difficulties. 2. Prioritize Your Planning What’s most important to you about your new data center? Do you just want to make sure it fits in your new space? Do you want to spend every minute you can making it more energy efficient like Facebook does? Figure out what you really want to get out of moving your datacenter, and focus on that. 3. 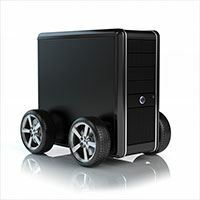 Use a Dedicated IT Moving Service Find a CRN member that has been moving IT equipment for years. You can find just any moving service. But if they don’t have experience moving IT equipment, disastrous situations can occur. Ask your CRN member how much experience they have making moves like yours. They’ll know how to get it done in a short timeframe, making the process as painless for you as possible. 4. Make Sure You Start Monitoring as Soon as Possible When things get set up fast, mistakes can happen. Get your monitoring programs set up immediately to check for errors and resource usage. 5. Avoid Making Big Mistakes Yes, it has happened where companies store their data center equipment in a shed outside. Don’t do that. Also make sure you avoid storing your data center equipment under desks or any area with unsecured physical access. If the wrong person gets physical access, they can cause an infinite amount of damage. 6. Use a Reliable Hosting Company You can try going the cheaper route. But if you do that, you expose yourself to potentially having 80% uptime. That could put a killer dent in your business. In an ideal world, you plan your move well ahead of time. When you just can’t make that happen, follow these tips, and your move will go a little smoother. When you need to relocate your business and personnel consider hiring professional commercial relocation packers to protect and package your assets. Packing is often a task that is underestimated and can lead to delays when it comes time to move. Professional packers are organized and know how to pack efficiently and appropriately ensuring that your assets and personnel are ready to go on load day. What items should be packed? More than you might think. Consider your computers for example; computer towers need to be handled with care and packed appropriately with cushioning to allow safe transport. Unsecured towers that lack cushioning during a move can lead to failed hard disk drives and a loss of sensitive data. It’s important that computer towers are at the very least wrapped in anti-static electronic bubble-wrap prior to handling. Once the towers are wrapped they can be loaded into computer carts or boxes for safer handling and transportation. It is often assumed that electronic items such as printers, scanners, phones, or computer peripherals are strong enough to move without packing, or that they can be packed in a box with other items without the appropriate packing materials. This can be a costly mistake considering some of these items can cost hundreds or even thousands of dollars in repairs or replacement if damaged during a move. Professional packers are trained and experienced with handling such assets and will prepare them and pack them safely saving you time and money while providing you with peace of mind. Did you know that members of CRN are of the best in class for providing professional packing and commercial moving services? Wouldn’t you rather reduce the risk of damage to your expensive electronics and delicate equipment? Choose CRN and have your assets packed safely and appropriately prior to moving your business and you’ll be glad you did when everything is unloaded and working properly at the other end of your move. If you need to move your offices and have been searching the internet for movers, make a list of the ones you may be interested in contracting with. Call the office of each mover on your list and ask to speak with their commercial relocation specialist and plan on taking about ten to fifteen minutes to briefly interview them. When it comes to commercial relocation, you want to be sure your movers are capable and properly equipped with the appropriate equipment and know how to get your job done right. Discuss your specific needs with each company representative and find out how many crew members they would estimate to be needed for your job along with a vehicle count, the amount of experience their crews can offer, and even find out who their commercial move foreman is and ask about his experience as a foreman. You want to make sure you have enough manpower for your job and that your assets are safely moved with respect and efficiency. It would be beneficial to find out about each company commercial foreman’s unique history because this is the person essentially responsible for managing the moving crews and providing you with satisfactory service. Remember to inquire about the company itself as well. Ask about the company’s history, claims record, and even plan to drop by and have a look at their facilities and fleet. This is especially important if you will be storing any items with a moving company because you want to make sure your assets are properly and adequately stored. Sensitive electronics, robotic machinery, and clean room equipment needs to be stored in special conditions in many cases and you need to make sure you’ll receive sufficient service for your items and merchandise. Your search for the right office movers can be a rather time consuming project in and of itself but when you work with members of CRN, you don’t need to worry making sure you get the right movers. CRN ensure that all of their office movers and commercial relocation professionals are of the best of the best. As members of CRN they are required to stack up to a higher set of standards than the average moving company and deliver a superior overall performance. If your company is operating on a budget, you might ask your CRN team to only physically move your IT equipment. To save some capital, you’d like to leave its packing to your employees. Be careful during the process though, because you could lose data and cost yourself additional downtime. If you have your IT team do the packing, make sure they do this: 1. Appraise Your Current Situation How many servers and PCs do you have? Which are the most important? Which should be moved first? How long do you think it will take to move all of this equipment? What possible hurdles could come up that might cause problems? By conducting a full appraisal of the state of your IT equipment, you can anticipate and avoid many problems that otherwise might happen. You’ll also have a cohesive plan and relatively accurate timetable that helps you coordinate the rest of your move. 2. Test the New Location Before MovingThis actually helps you reduce some downtime. Test out all your cables, UPSs, switches, and routers at the new location prior to the relocation of your servers. This eliminates a number of sources of problems. When it’s time to relocate your servers and clients, you’ll have a good idea of where any problems with your network might exist. 3. Plan for Downtime Even though you might do everything possible to prevent downtime, it’s still going to happen to some degree. However, your careful planning and network testing helps reduce some of the downtime. Some movers offer to do as much planning as possible up front, but does that time spent planning reduce your costs more than if you never planned and just lived with a little downtime? That’s a tough calculation to make. Make sure you calculate a “worst-case” scenario that reflects how much downtime your business can afford. Just make sure that your plan for moving can handle this amount of downtime. Remember, if you can’t do this on your own, don’t try to cut corners where possible. It will be worth it to talk with your CRN team instead. Many companies end up using a professional mover because they tried to do the work on their own, but then found out they couldn’t. That only costs you time and money. Instead, do it right the first time and pack your equipment on your own, or contact your CRN team member for help. 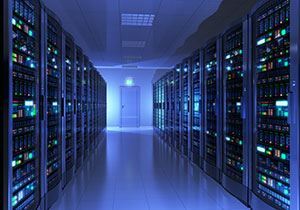 If your company is large enough to have a data center, you’ve probably got a reasonably large move ahead of you. Moving data centers is complex and must be planned carefully. What should you do to ensure a smooth move? Pay attention to the following: 1. Know Your Timeframe in Advance During any part of the moving process, you don’t want to be caught doing things at the last minute. It happens at all levels – both the corporate and small business level. Get a rough estimate of your timeframe in advance, and make sure you communicate this itinerary to your staff, vendors, and CRN team. 2. Keep a Tight Lid on Security Some of your data is no doubt highly confidential. The answer to the security question is to have a chain of custody in place. This means your items are numbered and listed in a sealed container, they remain in constant possession of your CRN team, and that they arrive in the exact same condition as they were shipped. Basically, your equipment is constantly accounted for, never leaving the attention of you or your trusted CRN team member. 3. Can You Afford Downtime? If you have a significant amount of equipment in your data center, it will take some time to move it all to your new destination. Can your company live with some down time? If not, you may have to move the equipment in stages. You might also have to use some temporary equipment until you’re all settled in your new location. 4. Who De-Installs the Equipment from the Racks? You may or may not have to do this. It’s really your preference. If you do, make sure you have insurance on your equipment. If you’re not sure whose responsibility this is, let your CRN member do the job. It’s one of the most important during the process of moving your data center. 5. This is a Great Time to Remove Obsolete Technology But only do it if this is in your budget. Often times, your CRN team can take care of the disposal for you. Be thorough, and go through your entire inventory right away. 6. Have a Backup Plan You need to have this plan in place for many reasons. First, you should back up all of your data before it moves. But, in addition to that, you should be ready for some delays in the process. Accidents happen and things don’t always work the way they should. CRN team members get sick or have family emergencies. Talk with your CRN team to get ideas of what you should have in place with your contingency plan. By following those tips, you’ll have a smooth data center move process. Enjoy your new location! 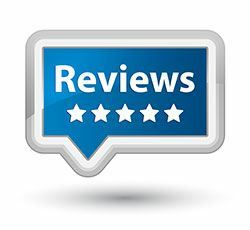 Check out web reviews. These come straight from customers. Most sites are good, but look out for Yelp. That company is known for posting bad reviews highly for all companies until they pay Yelp more money for their listing. Google Reviews and Angie’s List are very reliable. View their BBB rating. Any decent company should have a grade of “A” or better. It’s important to remember that businesses with grades lower than “A+” could have that rating just because they haven’t been around as long. Don’t take any single review or BBB score as the definitive word – just consider it along with other factors. Ask for client references. Any reputable company should be able to produce several. You can talk to them if you want, but it’s not necessary. Get an estimate from your favorite 3-4 companies. By now, you’ve probably identified several movers that look good at what they do. When you get the estimate, ask as many questions as possible so you get to know the company’s personality. Consider price, but don’t make it your primary concern. Instead, choose the company with the highest integrity. They generally charge more up-front, but that’s because they’re not cutting corners behind the scenes. And if something goes wrong, they’ll make it right. Visit the FMCSA. The Federal Motor Carrier Safety Administration oversees the actions of all moving companies. Call 888-368-7238 to check to see if there are any complaints about the companies you’re considering. Ask about your mover’s experience with IT equipment. You’ll want to know about the size of the moves they had to perform. Did they work with corporations or small businesses, or both? If you follow these tips, all companies who pass these checks will be good at providing the quality of service you want with no hassle. Choose the one you believe has the highest integrity, and even if something goes wrong, the whole relationship will work out well.